3 Things: All About Spring | What's on Your Easter Menu? I love collection posts and this one made me think about things I hadn’t considered, like my Easter menu, and my Spring bucket list. I love when post prompts make me think of things I wouldn’t normally, or to take a look at my life in a different way! So, I’ve never made a Spring bucket list, until now! There is a Daffodil Festival at a place called Hubbard Park in Meridan, CT. I’ve never been to a daffodil festival, but it sounds amazing! I must go to this! I’d like to take the family camping, see the bullet point above, at least one weekend a month. My yard needs a serious spring cleaning. It’s a hot mess. I am not responsible enough to have a yard, and this is my first time having one of my own. And you can tell…and I’m sure the neighbors can too. And, what I consider most importantly, I can’t wait to open the pool and have a pool party! One of the big, fat, selling points of this house was the pool. We barely got to use it last year since we moved in September and it was super cold. I am so ready to break it open, give it a good cleaning, and throw my family into it! Spring Cleaning, Spring Forward, or Spring Break. Which is your Favorite and Why? I hate to say it but, out of the three, I choose Spring cleaning. Anyone who loves ‘Spring forward’ is crazy, straight up. Who wants to lose an hour of sunlight in the morning? I hate waking up in the dark. And Spring Break hasn’t existed for me in a long time. This year is probably the first real one for us, since Jack is in public school, but I’ll be out of town for work. So for me, it’s just another week. Spring cleaning is when I throw open all the windows and spiff up the place! And then I have an allergy attack, close the windows, and install the air conditioners. What 3 Dishes will be on your Easter Menu? My first Easter in my new house! What will I be making? I have never cooked Easter dinner, my mom usually does it. I’m going to ask my mom to make tomato sauce and I’ll make stuffed shells. Growing up Italian, we had pasta during literally every holiday. 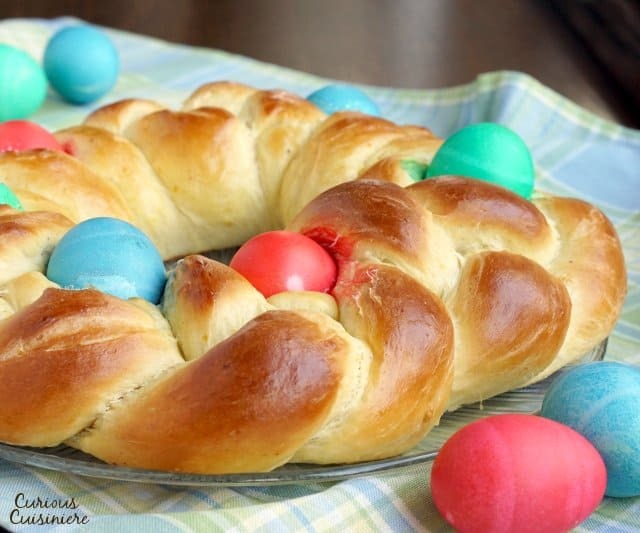 I’m also going to make this Pane Di Pasqua. My grandmother used to make this, and although I never ate it, just the sight of it makes me think of her. And that makes it feel like Easter. I listed this Italian Easter Bread in my Coffee and Cake Catch Up last week. The third thing I’m going to put on my Easter menu is Carrot Cake. Even though my kids will most likely not touch it, and Eric doesn’t eat cream cheese frosting, Carrot Cake seems like a great idea for Easter! Do you have a favorite carrot cake recipe? I don’t have one, and I am tired of making recipes from the internet that don’t work out! I’m thinking of using this one, but I’d definitely much rather get one from a trusted member of the ATLS family! What 3 things will you have on your Easter menu this year? Also, do you have a Spring bucket list? I’m linking up with The Horton Family, head on over! I found a new blogger thanks to you, on this Monday morning!! Also, YOU HAVE A POOL??? I am definitely coming this summer to help paint the kitchen, see Stars Hollow, and lounge by the pool with a fruity-loaded with points-alcoholic concoction. I can’t believe I do! It was on my wish list for a house, but I never really thought I would get it! It’s been out there mocking me since we moved in though cause I can’t swim in it! I’m sooooooo ready to get it open! And yes yes yes! I would looooooove to have you here! You can bring Ella for a field trip! Absolutely LOVED your post! Thank you so much for writing we me today! You will love, love, LOVE your pool this summer!! We have one and I am waiting with bated breath for all the pollen to be gone so that we can open ours up and get it ready, too. Our favorite place to entertain is by the pool where we have an out door cooking area that we refer to as “the cook shack.” Looks like your Spring is off to a FABULOUS start or at least will be very soon! Thank you Laura! And thank you for the awesome prompts! I really am so excited to get the pool opened, not just for our immediate family, but also because I know it will bring the rest of the family up! I’m not above bribing family with a pool party! Also, I love the cook shack! We haven’t gotten the porch set up yet. I am so excited to get a cook shack of my own! Also, do you have any pictures on your blog of your cook shack and set up? I’d love to see it! I’m looking for inspiration!